Everglades wild land firefighters are in the unique position to do something that would make urban firefighters shudder: They actually set fire to portions of the Everglades. Alumna Bleu Waters ’10 is the newest addition to the fire team that uses controlled burns to ensure new vegetation grows and to prevent the wildfires that occur in the third largest national park in the lower 48 states. Waters and her fellow firefighting team members don their protective gear (fire retardant blouse, pants, boots, and gloves and helmet) and use what’s called a drip torch to strategically set fire to areas as large as 31,000 acres. Many times the team sets back fires in an attempt to halt the advance of a wildfire (or redirect it) by burning up fuel in its path. 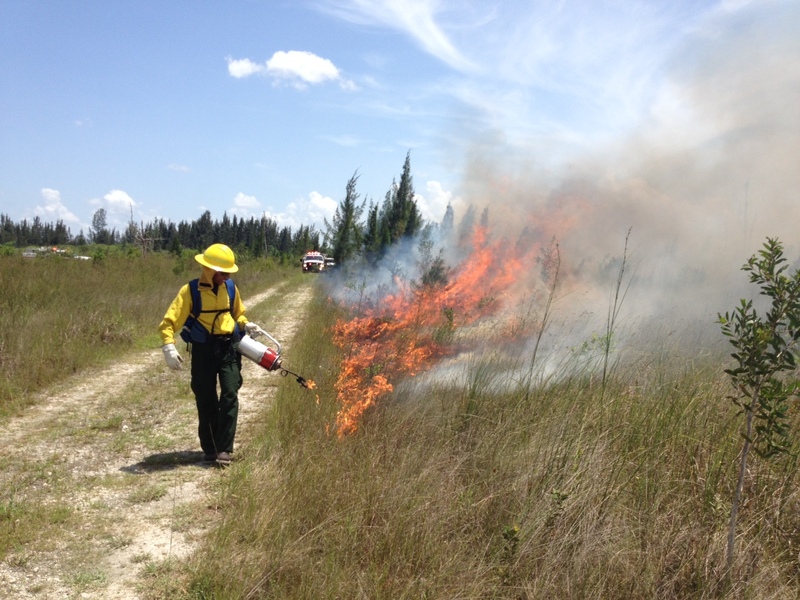 Waters uses a drip torch to strategically set a fire in the Everglades. Waters started her career at the Everglades National Park 18 months ago as the Greening Youth Foundation intern at the park. The foundation works with diverse, underserved and underrepresented young adults in an effort to develop and nurture enthusiastic and responsible environmental stewards. As part of her internship, Waters researched the Everglades, educated visitors, ran park tours and learned about fire safety. Now, she is the first ranger on the Everglades fire management team who also teaches fire education. In this newly created position, she will interact with park visitors, teaching them about fires in the park. 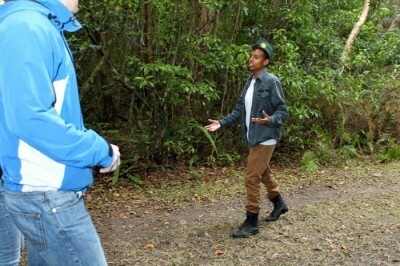 Waters is the first ranger on the fire team who also teaches park visitors about their work in the Everglades. Interns are not allowed to work on the fire team. It’s simply too dangerous. Diaz and the other park rangers decided that if Waters could not fight the fires then perhaps she could work on the team to teach visitors about what the fire team does. During her internship, Waters spent one day a week on fire training. She suited up and learned everything she could about the job. Waters, a Maryland native, came to FIU specifically to study at a school where she could have an impact, but she never imagined part of that impact would be working in the Everglades. She took that desire to grow and change things to the next level during her internship. Diaz and other park rangers were impressed with her ability to jump between several positions at once. One of Waters’ favorite challenge was something called the Sloughsog. It’s basically an on-foot trek through the Everglades with a group of visitors. She said out of all the activities she participated in as an intern this one had the greatest impact and is among the reasons she stayed with the park.